Email [email protected] to enter. Register: by May 15. Deliver: Four 12 oz. bottles to the Dam by May 31. Entry Cost: $10/beer or 3 beers for $20. Limit: 3 Beers / Homebrewer. Seven categories: Light Lagers, Dark Lagers, Hoppy Beers, Ambers/Reds/ Easy Drinkers, Dark Ales, Belgians/Saisons, Experimental Fruit/Herb/Spice Beers. Categories with less than 5 entries will be combined with the closest category. BEST IN SHOW will win a $50 Dam Gift Certificate & 15 gallons of your winning beer will be brewed on our small batch system with your recipe sold ON TAP at the Dam Brewery. 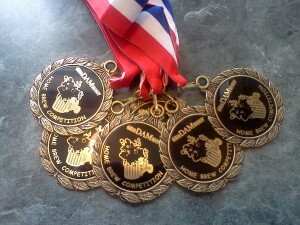 Prizes & Medals for top beer in each category. Awards ceremony Friday, June 14.